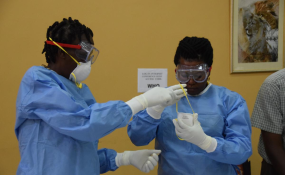 Health workers practice proper donning of protective gear during training on vaccination against Ebola. The World Health Organisation (WHO) has emphasised that an experimental vaccine is playing a major role in controlling the spread of Ebola in the ongoing outbreak in the Democratic Republic of Congo (DRC). Without the vaccine, the outbreak has the potential to spiral out of control, considering the country's social and political landscape as well as the sheer ability of the virus to spread. It's clear that having a vaccine in use early in an epidemic is a significant breakthrough in the fight against this deadly disease. And yet, six months after the first case was diagnosed, the outbreak is still not contained and cases are being reported almost daily and occasionally spreading outwards. Normally the DRC is well prepared and has substantive experience in dealing with Ebola. But a number of factors have hampered the current situation and made it hard to contain the outbreak - even for experienced frontier medical teams. The "immediate" group didn't contract Ebola while some individuals in the delayed group contracted the disease. This evidence gave the WHO hope that the vaccine could be 100% effective. But that point hasn't yet been reached. More data and investigation are required before the vaccine is licensed for general use. The rollout of rVSV-ZEBOV in the DRC has been done using a conventional strategy common in other vaccine trials. Called "ring vaccination", it involves vaccinating the first and second degree contacts of an infected individual. The aim is to form an immunised "ring" around every infection and prevent it from being transmitted further. The WHO's confidence in the vaccine has been boosted by the fact that the cases of Ebola haven't increased at the same rates as was the case in 2014 in West Africa before the vaccine was introduced. But vaccine effectiveness isn't always straightforward to gauge. Detailed data from the current outbreak will help make a more confident assessment and predict the future of its licensing and application. Currently, the WHO and the international community are in favour of the Merck rVSV-ZEBOV vaccine, as it has already been used and a number of studies prove that it's a promising candidate for licensing in the near future. In the current scenario, it's a ray of hope in addressing the current outbreak and preparing for future ones. Merck has recently promised to roll out another 120,000 doses of the vaccine to the DRC. The viral disease burden in Africa is largely underestimated and the rVSV-ZEBOV vaccine is hopefully the first of many to be fast-tracked and invested in, to address what is fast becoming a global health challenge. It's certainly a much needed vaccine in the fight against Ebola.